Click on the preview to download. Made with adorable Clip Art by Trina Clark! 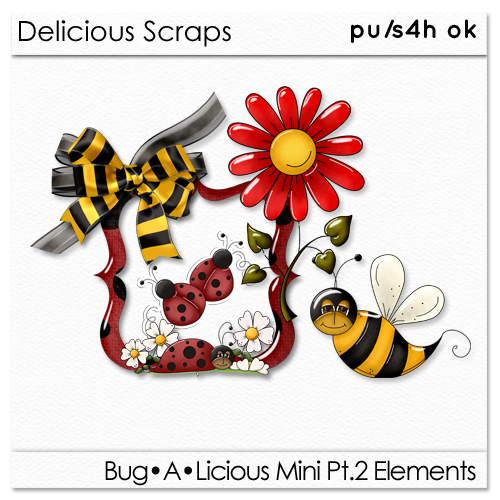 myscrapbook says: thank you for the extra elements and papers to bug a licious kit. love it. You spoil us with these great freebies, thank you. This is bee-autiful. Thank you so much for sharing and leaving you some love. Cute Cute Cute! Did I say cute? I've just finisched downloading the 4 parts of this really lovely kit. Thank you sooo much !! Thank you for this great addition to the Bug-A-Licious kit! Thank you so much for this mini kit add-on, the kit are cute! I love this series. Thank you so much! This is such a sweet, very pretty kit! I'm happy to see more to it :) Thank you very much! Thank you so much for this Freebie. I want to let you know that I posted a link to your blog in Creative Busy Hands Scrapbook Freebies Search List, under the Page 4 post on Jul. 25, 2009. Thanks again. you rock.....thanks so much for being sooooooooooooo generous with your time and extraordinary talent. Thank you so much! This kit is too cute! This is so charming. Thanks so very much. Love your little bug collection!! Thank you so much for sharing both kits! So nice! Tx for sharing! This is nice kit. Thank you! These are adorable and so are the papers! Thank you for sharing your adorable kit! I love it. How cute are those buggies. It makes a gurl not even be afraid of the creepy crawlies!!! LOL Thank you for sharing your great big talent hunny. This is adorable, thanks so much for sharing it with us. as cute as a bug in a rug. thanks for sharing! So cute. Thank you for sharing.